Darby Hand, a 2014 Hayward High School graduate who was born and raised in Hayward, WI, competed Saturday, March 30, 2019 in the Mid-Atlantic States Intercollegiate Woodmen's Meet at the Haywood County Fairgrounds in Waynesville, North Carolina. Darby participated as a student for Haywood Community College Department of Natural Resources Lumberjack team. Not only did the team take first place, but Darby also competed in the Stihl Timbersports Collegiate Series Mid-Atlantic Qualifier to move onto the Stihl Timbersports finals in Milwaukee at the U.S. Professional Men's, Women's and Collegiate Championships at German Fest, Milwaukee, WI Henry Maier Festival Park, 200 N. Harbor Drive, Milwaukee, WI July 26-29, 2019. Darby Hand took first place and is headed to Milwaukee! Darby spent summers at the Lumberjack Bowl in Hayward, starting out with logrolling at four years old. At 16 he went to work for Fred Scheer’s Lumberjack Shows, eventually moving up to a manager position. 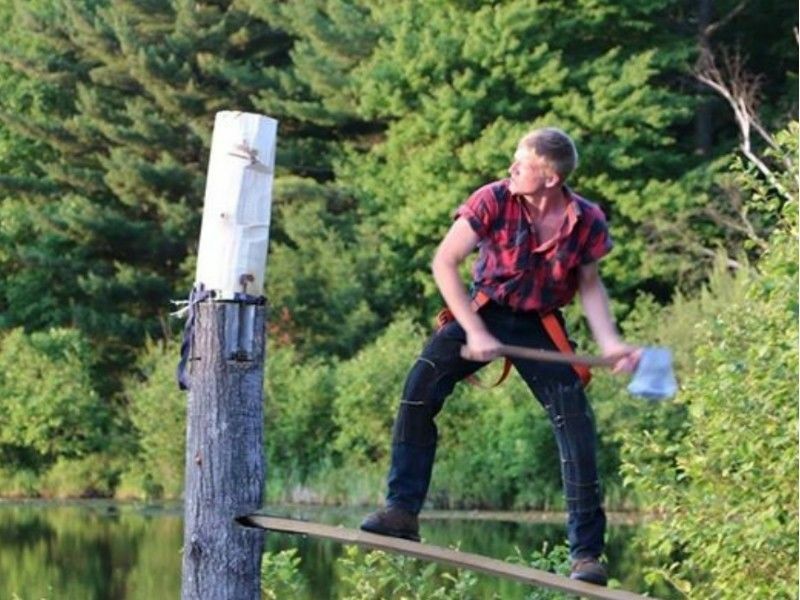 He has competed locally at the Lumberjack World Championships in logrolling and lumberjack events. This past year he moved to Pigeon Forge, Tennessee to work for Paula Deen’s Lumberjack Feud and started studies at Haywood Community College. “Since its inception in 2003, the STIHL TIMBERSPORTS Collegiate Series has grown in leaps and bounds. Every year the increase in participating schools illustrates its popularity and success. The Series currently boasts 62 schools that compete, a big jump from just six schools in 2005. Participating schools select their best lumberjack to go head-to-head in four professional disciplines of single buck, standing block chop, stock saw and underhand chop. The lumberjack with the most points after all four disciplines earns a spot in the STIHL TIMBERSPORTS Collegiate Championship. The five qualifier champions and one wildcard pick compete in the Collegiate Championship to determine the ultimate collegiate victor of the sport. The collegiate titleholder then earns an automatic entrance in the following year's STIHL TIMBERSPORTS Professional Series. The Collegiate Series has grown into five regional qualifying events, which are similar to collegiate athletic conferences, the Mid-Atlantic, Mid-Western, Northeast, Southern and Western qualifier and one championship”.